See our antique Turkish rugs now available. Hanging on the wall is the ideal placement for this one-in-the-world early 19th-century rug. 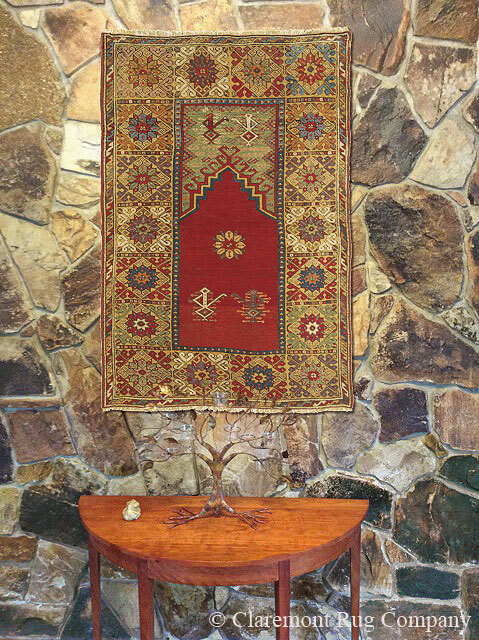 Suspended gracefully at eye level, its every individual nuance of design and natural color in this 200-year-old rug is displayed to greatest effect. This strategic placement allows it to be contemplated at leisure from an immediate, intimate distance, while it is comfortably preserved from further use. As breathtaking as it appears in daytime, just imagine the energy this iconic piece will exert at night, illuminated by the flickering candlelight from an elegant, tree-formed candelabra on the table below. Just as any masterwork painting or tapestry, exceptional art carpets are increasingly being placed as wall art, taking their place as central aesthetic touchstones of the connoisseur’s home.